Over the years I’ve written a lot of plans for different companies. I was quite proud of most of them. A few were singled out by corporate management of the national firms where I worked as models for the other business units. Most were based on sound research, endorsed by managers and staff alike, and characterized by innovative yet practical strategies. But all but a few of these plans shared the same fatal flaw. In the end, they had little impact on the company or business unit. Was this because the strategies didn’t work? I’ll never know; we didn’t give them a fair chance. There was little serious commitment to follow-through—an all too common shortcoming with planning efforts in our business. How about your firm’s plans? I certainly believe in the value of strategic planning. Yet most plans are not adequately carried out to substantially benefit the firm. David Maister, an internationally known consultant to professional service firms, has written that he has seen remarkably little difference in the market insights and business plans of competing firms. The major difference between the leading firms and the average ones is not strategy, but the ability to implement the things they set out to do. Organization. 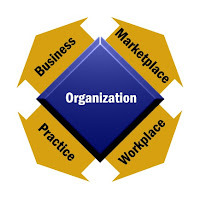 This refers to the organizational structure and functioning that is at the heart of everything you do. This is a good place to start because organizational issues are often the root of implementation deficiencies. Marketplace. This relates to your targeted markets, competitive positioning, key client relationships, and business development process. Most strategic plans, of course, devote the greatest attention to this facet of your business. But it is best considered in the context of the other core operational areas. Workplace. This is the culture, environment, policies, and compensation created to attract and retain talented and loyal employees. Given the long-term projected shortage of technical professionals, this has emerged as a critically important strategic issue. Don’t shortchange it! Practice. This refers to the investment made to develop and maintain the technical capabilities and resources needed to fulfill existing and emerging client needs. The practice aspects of your business are obviously closely tied to the marketplace, but should be dealt with as a distinct planning issue. Business. This relates to the company’s financial management and performance, shareholder value, risk management, and ownership issues. Identify the 2-3 most crucial issues in each core operational area. Looking out over the next three to five years, what issues will have the greatest impact on your organization, marketplace, workplace, practice, and business? What opportunities in each area hold the greatest promise for your firm? Identify long-term goals to respond to these issues. Working from your list of key issues, determine how you need to respond and what changes are needed in each core operational area. This helps shape your vision of what the company will look like in the future. Define a singular vision for each core operational area. Vision is a picture of a desired future. I prefer looking out five years in defining vision. Your vision should capture the key attributes and strategic priorities that will characterize the company. To keep this more practical, I recommend deciding what the most important long-term goal is for each of the five core areas. For example, you might determine that superior client service is the priority for the marketplace, or that moving to a market-based structure from disciplinary departments is desired for organization. Your vision shouldn’t prevent you from pursuing other goals in each operational area, but it defines where you will focus your energies. Now that you’ve defined where you’re going, how will you get there? Focus on the “big picture” actions that will position your firm to accomplish your vision. Whereas vision looks out five years, it’s best to think of strategy in terms of the next three years. Don’t be too limited by your vision. For example, if your vision for the marketplace is superior client service, that doesn’t mean you shouldn’t consider other marketplace priorities like sales, proposals, marketing, and key account management. But all aspects of your strategy should be consistent with your vision. Develop the basic strategy for achieving the vision in each area. Strategy outlines the "how-to" but stops short of defining detailed actions (which comes later in the process). Good strategy positions your firm for maximizing opportunities that enable achieving your vision. Like vision, it should promote focusing your efforts on the few things that matter most. So it's a good idea to have measurable goals and to establish priorities as part of defining strategy. Address the barriers to implementing your strategy. Define both what you need to do and what will keep you from doing it. It’s critically important that you identify both the potential barriers and how you’re going to overcome them. Prepare brief action plans for each strategy. Don’t include any more detail than necessary. Typically all that’s needed is a list of actions, resources needed (time and money), deadlines, and responsible individuals. Simple plans are more likely to get implemented. Determine the level of effort. Plan implementation is best achieved when it’s treated like a project. The action plan should define the scope, schedule, and budget—at least in terms of the hours needed to complete the prescribed activities. Before committing to the action plan, decide if you can dedicate the needed resources to get it done. Specifically budget people’s time. Too often, plan implementation is dependent on people donating non-billable hours when they “get around to it.” With pressures to keep billable and other demands on their nonbillable allotment, it’s no wonder that so little gets accomplished. If it’s important, you have to budget their time and give it the same importance as project work. Decide what you’re willing to give up. A common mistake firms make is to continue heaping new responsibilities on their best people without offloading anything. It simply doesn’t work! Once you’ve defined the level of effort needed to implement the plan and who’s responsible, determine what responsibilities they are going to give up to allow them the time needed for their new assignment. Assign an “implementation czar.” As soon as your planning retreat is over and everyone returns to the office, other matters will supercede the assignments made. One individual needs to monitor progress, help hold people accountable, and keep management involved. This may be the CEO, chief operating officer, or other person with appropriate authority. You might even consider an outside facilitator, a role I’ve played with success in the past.